SUMMARY: When HomeAdvisor rebranded itself in 2012, the marketing team was able to rescue its low deliverability rate and completely relaunch its consumer email marketing program. With sends in spam folders across major ISPs, the team set up a strict send segment and began testing relevant content that would grow engagement. Read on to see how they were able to increase email-generated revenue by 114%. 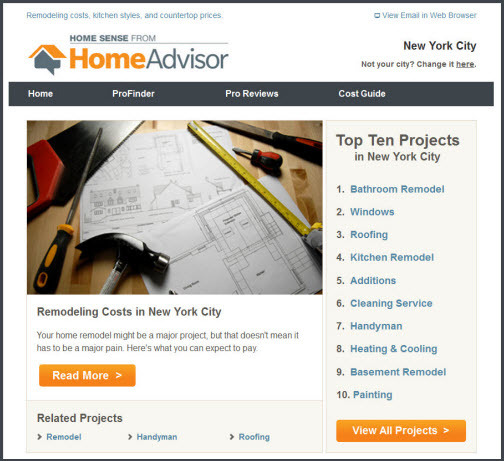 HomeAdvisor connects homeowners to service professionals for home improvement and repair projects, with each of the 80,000 service professionals having been background checked, rated and reviewed by the service for free, according to Jill McEwan, Director of Direct Advertising, HomeAdvisor. "Just to give you a little bit of the scope, we'll do around five, maybe five and a half million homeowner requests this year. So that's when a homeowner goes on our site and says [that] they need a plumber, they need an electrician," she said. With parent company IAC, which also owns Match.com and Vimeo, HomeAdvisor has been around for 15 years. However, for the first 13 years, it was known as ServiceMagic. In 2012, the company rebranded itself to become HomeAdvisor. In the transition, McEwan said, the company wanted to retain customers and increase its lifetime value. Another goal was to bring in new customers by increasing brand awareness through a broader marketing mix. "As a part of our rebranding effort, we really wanted to connect with our customers on a new level. We completely relaunched our consumer email marketing programs with goals of staying top of mind, being a trusted adviser and driving content that was relevant and engaging for our subscribers," she said. At the time of the rebrand, the marketing team was sending to a very large, yet stale, list of subscribers. "We were sending out a cookie-cutter newsletter that was a one-size-fits-all approach. Basically, we were blasting and dispatching to as many people as possible. So needless to say, our deliverability was in the tank," McEwan said. Their sends were in spam folders across major ISPs, and open rates were extremely low because of that, she added. The rebrand effort was led by HomeAdvisor's new CEO, who has a marketing background and an understanding of the power of a clean and dynamic email marketing campaign. With this support, the team was able to get the resources and tools to expand the email program. After developing their marketing team, the first thing they did was onboarding their first email service provider. "We set up a life cycle approach, and we set up a welcome campaign. We set up a long-term engagement campaign and also a re-engagement campaign," McEwan said. After that, the team wanted to "focus on our deliverability problems and increasing our engagement." Because the email program had deliverability problems, the team started sending to only the engaged subscribers, with unengaged subscribers put "on pause," McEwan said. The team segmented their list by ISP, with the goal of finding engagement thresholds for the major ISPs. The question the team was asking was, "'What's the maximum amount of subscribers we can send to without jeopardizing our deliverability at certain ISPs?' So, we created segment groups based on activity and ISP. We focused on our top ISPs first," McEwan said. She gave the example of deliverability problems with Yahoo, where the team knew their emails were going into the spam folder and, as a result, where they had an especially low delivery rate. "We'd start to only send to people that had opened or clicked in, say, 120 days. To try to get a better reputation at those ISPs. We'd sit on that, let it go for a couple weeks, see if our open rate increased. If it did, we'd loosen that criteria. Maybe we'd loosen it out to 200 days and then we'd go to 280 and so on," she said. They adopted that back and forth strategy, responding as results came back, until they found weak spots within top ISPs. "Now, as you can imagine, we're sending to a much smaller list. It's probably nearly half the size as it was when we started," McEwan said. From this point, the team wanted to keep the engaged subscribers opening and clicking, while growing the list of engaged subscribers. To do this, the team came up with additions to the newsletter campaign with the sole purpose of driving engagement, instead of focusing on conversions. "As a team, we came up with campaigns like, 'Are you a house-aholic?' 'Is the dining room dead?' 'Is granite going out of style?' We found that those campaigns did, in fact, drive a high response rate and not very many conversions." McEwan explained that the longer someone is kept on the list, "the more opportunity we have for conversions down the road. So, as long as we keep them opening and clicking, they'll stay on the list," she said. 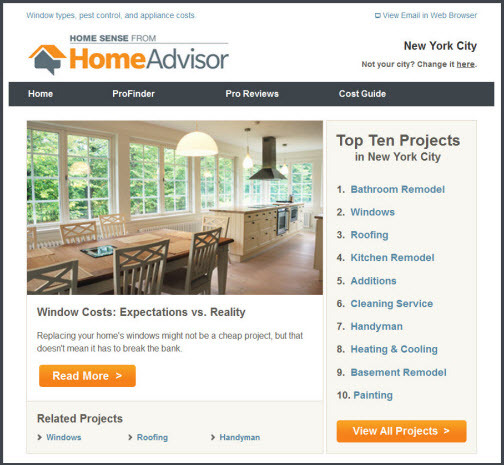 Not everyone is going to have a home improvement project right now, she added, but it's good to keep subscribers engaged so that when a project comes around, HomeAdvisor stays top of mind. Eventually, she added, they will loosen their criteria to try to recapture some of the unengaged users, but "I'd say we're pretty strict on who we send to because of the deliverability problems that we've had and the success that we've seen with these tactics." One of the most lucrative changes the team made was to redesign the newsletter into a modular template with box-like sections for articles and other features. "One of the things that we did was we rearranged different elements or different modules inside that newsletter. For example, we moved a highly convergent-focused module over to the upper-left side and found a big success there," McEwan said. The team also tested how many articles there should be in the newsletter — between three and five. The hypothesis was that, "if we have more articles, we'll have more things for people to click on and that'll drive our click rate higher," she said, adding that they also believed it might keep people in the email longer, which would help with deliverability. "We found that the click rate did increase when we had more articles, and we suspect that people are spending a longer time on our emails," she said. One of McEwan's favorite tests is one they call "our relevant content test. One of the goals for this test was to really send the right content to the right person at the right time," she said. When customers on the site are looking for remodeling service professionals, they fill out HomeAdvisor's form. When they click 'Submit,' they are matched to three or four different remodelers to get estimates, and three different emails are sent out. The first email has the subject line, "Remodeling Costs in [City]. How Much Should You Expect to Pay?" It lists the top projects in the subscriber's city, and the main call-to-action is to "Read More" about costs on remodeling. "We get that project cost information … from past customers who have submitted real projects and cost information to us. It's actually updated in real time. So [it's] really valuable to send something like that out to somebody who's interested in a remodeling project," she said. The second email's subject line is, "Architects: Your most important remodeling step," and it directs people to "give your floor plan full consideration to avoid costly and critical design flaws" as well as to read more about floor plan design. It takes customers through the process of hiring an architect and what questions to ask. The third email's subject line is, "Fantastic Flooring: What to choose and why," and brings customers through one of the next step of remodeling — material choices. "Furniture might bring a room together, but it's flooring that sets the tone. We'll help you figure out how to choose the best material for your home and personality," the email reads. "Those were three very personalized and relevant emails that we sent out," McEwan said. The first email was about window costs in a customer's particular city. The second email was about increasing your home's resale value. The third email was about increasing your home's energy efficiency — three topics that don't necessarily interest someone who is looking to remodel. "The results from this test were really phenomenal … This was a huge success, and we really want to focus on more relevant content like this moving forward. So we'll continue to test this and roll it out," McEwan said. "When we rebranded and we started, we had an email marketing manager here, and we all just kind of grew together. At first, we were focused on the newsletter, and then, we just kept expanding our knowledge and growing," McEwan said. There was some hesitation, she added, about sending to a smaller — although more engaged — list, because, "everybody wants to send to as many people as they can. But we had buy-in from our CEO and the team, and we decided to go for it … you can't keep people on your list who aren't engaged because they're just ruining it for everybody else who does want to receive your email." The results from the relevant content test were a conversion rate that doubled and a clickthrough rate that was 1.5 times greater than that of the control, according to McEwan. "It was ... one of the major tests that we did. It was a great learning experience. Everybody says that relevant content, targeted content, is the way to go, and we think so, too. But we hadn't tested it yet. What we found was just more than what we had expected," she said. If you're going to send to a smaller list, McEwan said, it's necessary to develop campaigns that increase engagement and grow the list of engaged users. "We're big believers in testing and learning, and even small wins are big wins when you think about it throughout the course of a year," she said, adding that, in the coming year, the team will be focusing on collecting data that will tell them more about customer's interests.